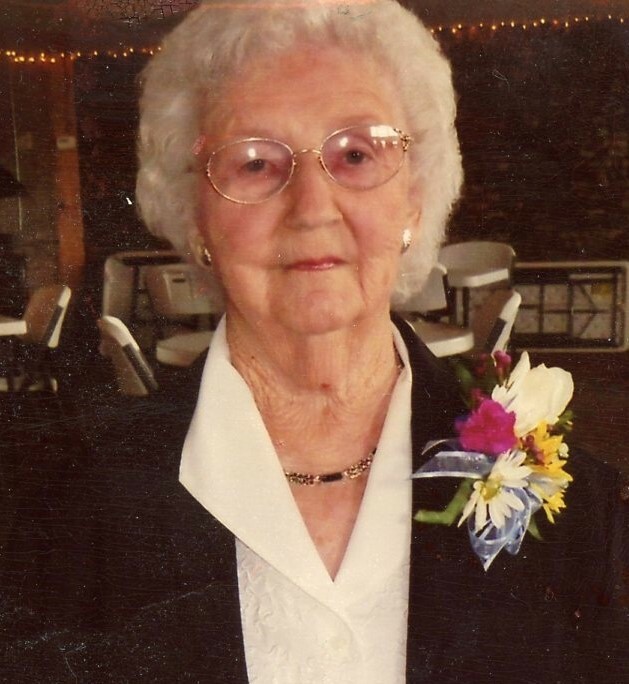 Erma “Erm” Stevens, 97, of Warsaw, passed away on Tuesday, January 22, 2019, at North Adams Home in Mendon, Illinois. Erma was born on March 23, 1921, at her parent’s home in Rocky Run Township, the daughter of Ethan and Freida (Montag) Foley. On July 25, 1942, she was united in marriage to George “Leslie” Stevens. He preceded her in death on March 2, 1992. Erma spent her life working as a homemaker for her family. A member of Trinity United Methodist Church for many years, Erma was also a former member of the Order of the Eastern Star. She was a talented artist, and enjoyed tole painting and cross-stitching. Erma was known for her delicious cooking and baking, and was best known for her homemade noodles, pies and sugar cookies. She loved her family, and was always ready to host family events at her home. She was the glue that held her family together. Erma is survived by her son Jim (Betty) Stevens of Augusta, Illinois; her daughter Sheila (Harry) Dillabaugh of Sierra Vista, Arizona; five grandchildren: Kelly (Troy) McCleary of Mendon, Illinois; Josh (Stacey) Stevens of Kearney, Missouri; Cheryl (Tony) Navarra of Denver, Colorado; Dan (Laura) Dillabaugh of Colorado Springs, Colorado; and Lucas (Katie) Stevens of Glennwood, Iowa; eight great-grandchildren: Kayla (Justin) Mitchell, Kara McCleary, Liberty Stevens, Kody McCleary, Gabriele Navarra, Jackson Stevens, Giovanni Navarra and Evan Dillabaugh; and her great-great-grandson Cutter Mitchell. Erma is also survived by several nieces, nephews and cousins. Erma is preceded in death by her parents, her husband George Leslie Stevens, her son Lynn Stevens, her grandson Travis Stevens, two brothers: Elmer and Jerry Foley, and two sisters: Esta Austin Crow and Loraine Froman. Funeral services will be held at 2 pm on Saturday, January 26, 2019, at Printy Funeral Home in Warsaw, with burial to follow at Oakland Cemetery in Warsaw. Visitation will be held at the funeral home from 1 to 2 pm on Saturday directly before the service. Memorials may be directed to Trinity United Methodist Church in Warsaw or North Adams Home in Mendon.